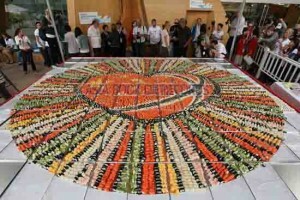 Norwegian Seafood Export Council (Norway), with the help of the student chefs from Zhonghua Vocational School in Shanghai (China), created the largest sushi mosaic at the 2010 World Expo Shanghai China, on October 15, 2010. 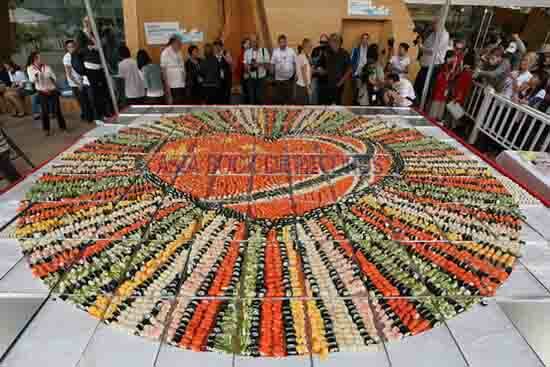 The mosaic covered 20.13 m2 and used 120 kg of rice and 65 kg of Norwegian Salmon, and took 6 hours and 15 minutes to complete (not including preparation time). The attempt was supported by the Norwegian Embassy in Beijing and Furuseth Group. Comments for LARGEST SUSHI MOSAIC are now closed.